In production for over 50 years, the Fortis Spacematic continues to be as relevant today as it was at the dawn of the space age. 50 years after it made its initial debut, the venerable Fortis Spacematic continues to remain one of the world’s essential tool watches. Like the space program itself, this durable, utilitarian design has continued to evolve, while remaining true to its original mission. Today, the limited edition Fortis Spacematic 623.10.41 L.01 provides a new generation of aviators and adventurers with the same durable construction, reliability, and easy-to-read design that made this iconic timepiece a favorite with the original Mercury astronauts. The rugged two-part 40 mm brushed stainless steel case has been fitted with an anti-reflective, scratch resistant sapphire crystal and a screw-down metal caseback that provides an impressive 330 feet of water resistance. 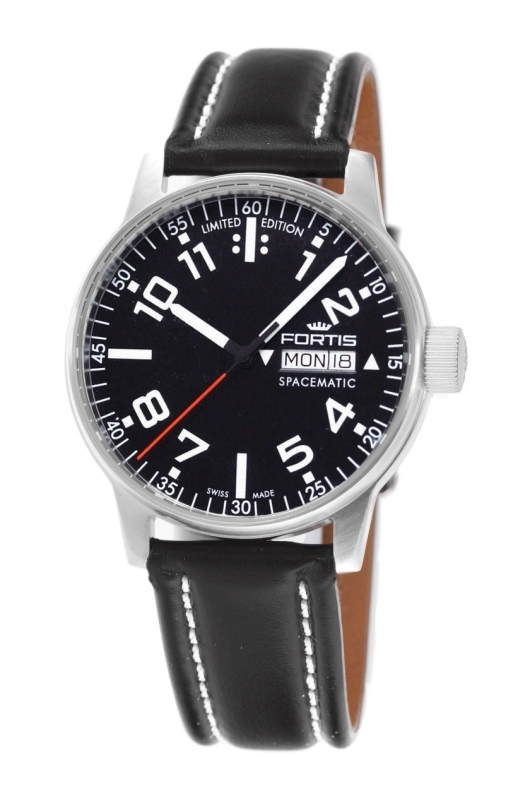 The easy-to-read black aviator style dial features a three-hand configuration with a red sweep second hand and an oversize bilingual day/date window at 3 o’clock. The large Arabic numerals, indices and pencil hands are coated with a special superluminova white paint that glows a bright green in the darkness. 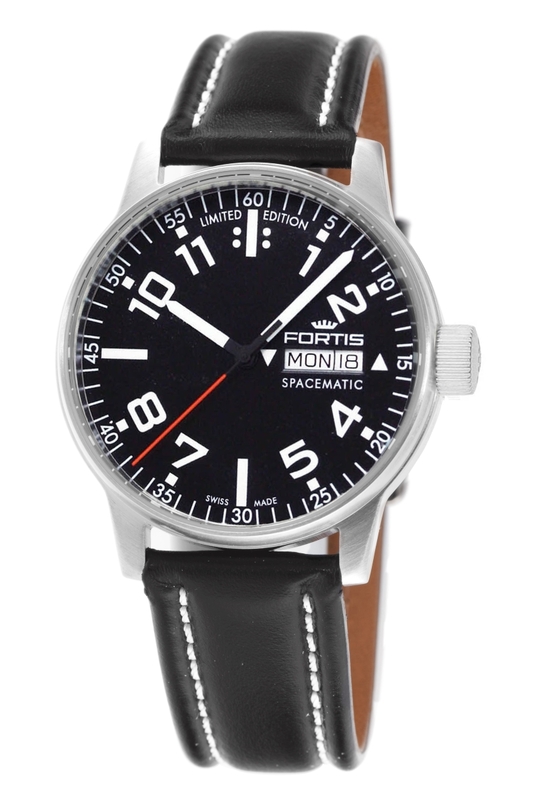 The use of an arrowhead at 3 o’clock to indicate the correct setting direction and a pair of flanking dots at 12 o’clock is a tribute to early Fortis aviation designs. A precision Swiss-made 25-jewel ETA 2836-2 movement designed to provide a lifetime of reliable service powers this superlative mechanical timepiece. To ensure the highest levels of accuracy and reliability, the movement includes both a fine timing device and an Incabloc shock absorber. The Fortis Spacematic 623.10.41 L.01 has been equipped with a luxurious 19.5mm padded black calfskin strap with contrasting white topstitching. The groundbreaking Fortis Spacematic is one of the reasons why Fortis continues to play an essential role in aviation and space exploration. The watch is as relevant today was it was in 1962 when it was initially introduced. If you’d like to wear a timepiece from a company that has actually proven itself in space, contact an authorized Fortis dealer immediately and ask to see the limited edition Spacematic 623.10.41 L.01.